Lift plans that are able to remove the risk associated are all about preliminary inspection and protection. Step One is inspection of all the rigging used for the job. Step Two involves risk management - asking your self all the right questions before the lift happens. 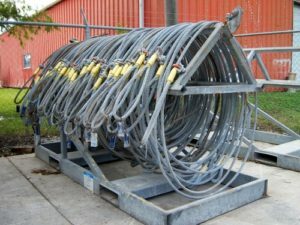 Frequent lift planning of rigging hardware inspection, damaged equipment retirement, and proper disposal of retired rigging components are essential to the protection of your crew, job site, and company. All slings supplied by Morgan City Rentals are fabricated to ASME 30.9 standards. Morgan City Rentals can perform load testing and compliance testing services for our clients as an additional added value service . Certification information is provided to the customer and is also stored securely in our on-line database. With a secure login and password, our clients have access to their certifications from any location through the internet. Contact any Morgan City Rentals/ Delta Rigging & Tools locations for pricing and availability.